Sixty years after Jaguar’s legendary test driver Norman Dewis achieved a world record average flying mile speed of 172.4mph in a modified XK 120, Jaguar returned to Jabbeke, Belgium, on Saturday, March 2nd, 2013 for another sprint test, this time with a new Jaguar F-TYPE V8S and race driver Andy Wallace. Jaguar has a long-standing historical relationship with Jabbeke that began nearly sixty-four years ago. 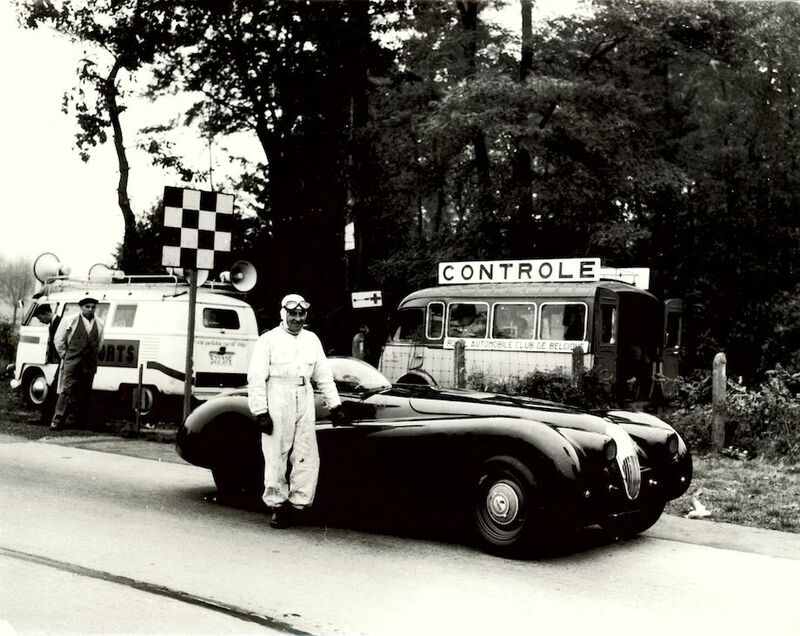 In May 1949, Jaguar decided to demonstrate the newly launched XK120 roadster to the press on a stretch of straight high-speed autoroute between Jabbeke and Aeltre in Belgium. The road was closed for the occasion. 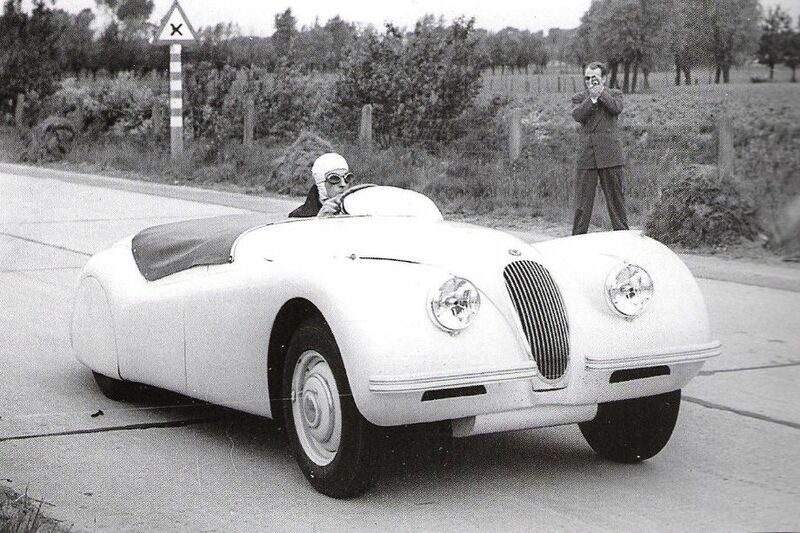 The white left-hand drive car, chassis number 670002, was the second XK120 built. Jaguar’s development engineer Walter Hassan was to have driven the car but he fell ill, so Jaguar test-driver Ron “Soapy” Sutton substituted. With hood, sidescreens and windscreen removed and the addition of a full-length aluminium undertray, a metal airflow deflector fitted in front of the driver and a tonneau cover fastened over the passenger side of the cockpit, the Jaguar was timed through the flying mile by the Royal Automobile Club of Belgium at 132.596 mph (213.393 km/h). The XK120 was subsequently declared the fastest production car in the world. This record held until September 1953 when Celso Fernandez, driving the new Z-102 Touring model from Spanish manufacturer Pegaso, broke four official Royal Automobile Club of Belgium records. These included the flying-start kilometer which he covered at a speed of 151.042 mph (243.079 km/h). On hearing this news, Jaguar Chairman William Lyons immediately called up Norman Dewis, by then Jaguar’s chief test engineer, and asked what he was going to do about it. Norman was doubtful there was much more to be had from the XK120, but the Jaguar team headed back to Jabbeke in October. The car they took was a rally prepared vehicle, registration MDU 254 which had undergone a number of subtle modifications to its powertrain and aerodynamics. These included a higher compression ratio, close-ratio gearbox and heavy-duty prop shaft, a full undershield, removal of the side and rear lights, a metal tonneau cover and streamlined headlamps. Perhaps the most remarkable feature was a Perspex ‘bubble’ cockpit canopy which was bolted down once Norman was in the car – something that also necessitated removal of the driver’s seat leaving just a thin piece of foam as Norman’s only support. The car had nearly slick tyres with just 2mm of rubber left on them, inflated to 50psi to further reduce drag – judged to be safe because the road was completely straight. Much to everyone’s amazement, Dewis smashed the Pegaso record with a top speed of 172.412 mph (277.47 km/h) verified by the Royal Automobile Club of Belgium, bringing the laurels back to Jaguar. The XK120 was once again the fastest car in the world. This feat was commemorated on its 50th anniversary in 2003 by the erection of a plaque near to the Jabbeke highway. In celebration of the events 60 years earlier, Jaguar returned to Jabbeke with the new Jaguar F-TYPE V8S and 1988 Le Mans 24 hour race-winning driver Andy Wallace. The original road used in the fifties is now a full-blown autoroute, but the Jabbeke District Council and Police kindly agreed to close a dual carriageway section of the nearby N377 main road for the sprint test to take place. With just two miles available to Wallace to explore the F-TYPE’s straight-line speed from a standing start, and bring it to a stop again, the car hit almost 180 mph and achieved 0-62 mph in an impressive 4.2 seconds.